The SU fuel pump as used in the T-Series MG is the same one used up until the MGB. There are variations but all work on the same principals. We all know the foibles of running an old SU pump.Its a must with a T-Series MG as its right out front on the scuttle for all to see when the bonnet is raised.The last thing you would want is a reliable modern electronic pump. What fun is that? With a little bit of maintenance and some upgrading, it can be quite reliable. But a failing pump can be aggravating and the main problem of course is the points. These used to be changed as a matter of course during a tune-up or service on these cars back in the old days. They would burn up after 10 or 15K miles, leaving one stranded or trying to figure out a way to pound on the pump with the bonnet open. An early attempt was made by SU to remedy the burning points problem by fitting a capacitor (condenser), which help to slow down the pitting on one side of the points and a build up on the other point. This was somewhat effective but in the 70s a much better improvement was made with the introduction of the diode. The diode conducts excess current back to the battery rather than across the points. This does not eliminate the problem, but it sure helps. The diode needed can be found at Radio Shack for about 1 buck or less. It is a bit of a pain to install because it must go inside the pump, under the cap where the contact set is located. Later pumps have a stepped cap, which has a good bit more room, which is helpful --- good flea market item to be on the lookout for. The original point set up in the T-Series pump was a single contact set. Upgrading to double points is a minimal effort to increase reliability. I cant imagine too many single contact sets still in use. I wont go into the procedure as its covered in the shop manual, but one of the main reasons for early trouble is the failure to clean the protective coating from the contact points. This should be wiped off with an oil-free solvent and then not touched by your fingers after installation. When you replace the point set, you have to unscrew the diaphragm. Be aware that all the little brass discs will fall out so do this over a tray of some sort. No trouble, they go right back in with little effort. Inspect the diaphragm and look for any dry rot or cracks, soft spots, etc. If the diaphragm is pliable and without cracks, its probably OK for several more years. Reinstall the diaphragm with the new point set, adjusting it according to the shop manual procedure. Pushing on the small disc in the center of the diaphragm should give you that satisfying roll-over and familiar click. You may need to rotate the diaphragm one hole either way to get it to sound healthy when you connect it to 12vdc. Next is the diode. Be aware that the diode needs to be installed the correct way relative to positive or negative ground. Install it backwards and the little diode will explode when 12v is applied, but no other damage will occur. Wear your safety goggles. Its not a big deal it just pops pretty loudly. 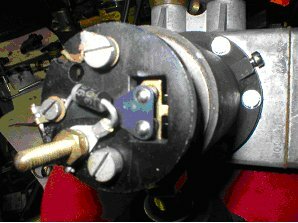 The band on one end indicates it is the negative end so on our + ground cars, the negative end goes under the screw head for the contact set. The other end goes to the post or input terminal, thus the diode is going across the pump coil connections. For ground applications reverse the diode. The trick is to be able to do this under the cap so that the cap will still fit. You may end up with the cap being just a bit too high and not fully seating. Wrapping a few rounds of electrical tape around the seam will suffice. This was done originally to the later pumps. You may still have the wide rubber band, which will be even better. Below are a few illustrations. Any questions or comment about this or any other MG related tech issue, please email me @ Mogfrog1@aol.com. See the drawings of the schematic, the pump, and a picture of the diode below.